My mom had a very dear friend who was an excellent cook and an extremely gracious person. Whenever she received a compliment about her cooking, she always said that it was her recipes that were good. 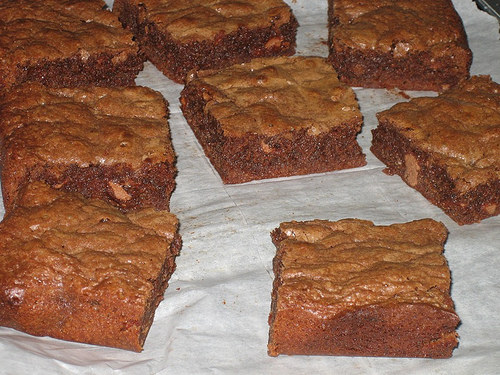 In that vein, I must confess that I have an excellent brownie recipe – Moosewood Fudge Brownies. When you open the cookbook to the page for the brownies it says something like: “on a brownie intensity scale, these are an 11”. I promised my kids we were going to make brownies and cookies on the weekend and they got all excited. They told their teachers they were going to bake and some of the teachers already put in their orders! So, that was it! We had to bake. We got everything all set up and went on MSN with the grandparents and started to make brownies. The kids were very into eating chocolate pieces and the batter with raw egg. (This was something I was NEVER allowed to do as a child, but it was almost impossible to keep my kids from putting their fingers in the batter. I guess we’ll find out later if raw egg really does have any lasting health risks!) Anyway, we talked, stirred, spilled, poured, scooped and all that good stuff until it was time to put the brownies in the oven. We said goodbye to the grandparents before the brownies were baked and started to clean up. I asked Chichi to check out the brownies in the oven and she said they were yellow. I thought that was weird, but… when I looked they were indeed not the chocolate colour I was expecting. 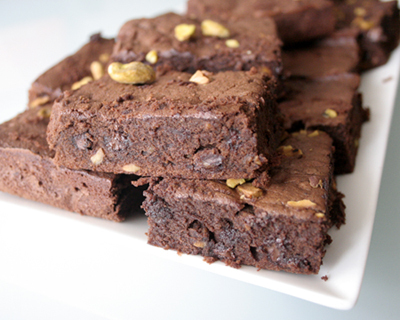 Milk chocolate does not make for an intense brownie indeed. Even though the brownies were not the best ever, I packaged them up and sent them to school with the kids. The teachers told me that they loved them and that it made their week! However, the cutest thing was that my kids loved taking the treats to their teachers even though it was not a special occassion. doggymaster12 on Gymnastics or soccer?